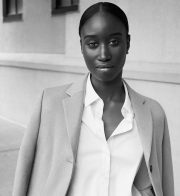 Amy Sall – We define what's next — inspired by Africa. With a keen interest in cultural studies, African affairs and artistic expression, Senegalese-American Amy Sall is a human rights activist enabling new and authentic perspectives and narratives on the continent told by the young, post-colonial generation. She also hosts several talks and panels and was a part-time lecturer at The New School University’s Eugene Lang College where she developed and taught two courses: Third Cinema & The Counter Narratives, and The African Gaze: Postcolonial Visual Culture of Africa & The Social Imagination. Amy once pursued a career in fashion by interning at VOGUE, however she quickly realised fashion was rather an interest than a passion and felt that her talent were better used in human and social affairs. As a Columbia University alumna, Sall holds a Master’s Degree in Human Rights Studies, concentrating on the right to development and youth empowerment in Sub-Saharan Africa. Her bi-cultural surroundings has inspired her to create SUNU: Journal of African Affairs, Critical Thought + Aesthetics. An independent, Pan-African and trans-disciplinary journal that was born during her final year of graduate school, SUNU gives space for young leaders to submit their work concerning Africa and the diaspora. “In a way SUNU is pushing back this traditional way of learning [from scholars, professors, top curators etc]”, she told Refinery29 Global Editor-in-Chief Christene Barberich in Unstyled. Through SUNU, Sall enables young people to have a voice and be recognised for their work and fights this notion that young people are not knowledgeable about current African affairs. Aside from being an advocate for the African youth, Sall is also a recognisable face within the fashion industry. She has worked with and was featured in major fashion campaigns including J. Crew, H&M x Kenzo and MANGO. Being inspired by her Senegalese roots Sall is showing a different outlook of African style by not wearing traditional wax prints but rather introducing a new African minimalistic aesthetic.